We have a lot of landscaping to do this year and we've slowly been working on it. Jakob was putting rock into a bucket and carrying it to the back to dump under the deck. Michael is starting on the deck. 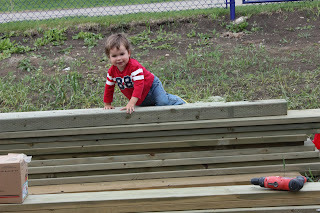 Levi mostly climbed all over the wood pile and tried to use the tools. Jakob really loves making silly faces!